The 13th Day has been invited to feature in the 28th Fajr International Film Festival in Tehran, Iran in February 2010. 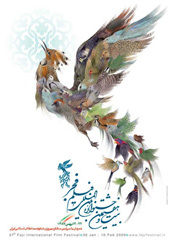 The festival commemorates the Islamic Revolution of 1979, each year the Fajr International Film Festival in Tehran screens some of cinema’s most socio-politically sensitive, original and subtle productions. Go to www.fajrfestival.ir To receive regular updates on the film’s progress register your contact details in the CONTACT section of this website. Thanks from The 13th Day team.